Police and army forces continued to search for a suspect who stabbed a Jewish youth at the Jerusalem neighborhood of Ramot on Saturday. The police believe that the attack, which left the victim, 17-year-old Yehuda Ne'emad, with serious injures, was nationalistically motivated. IDF troops were stationed at the entrance to Kfar Iksa, a nearby Palestinian village, and a police helicopter hovered above the region for hours in an attempt to locate the attacker. 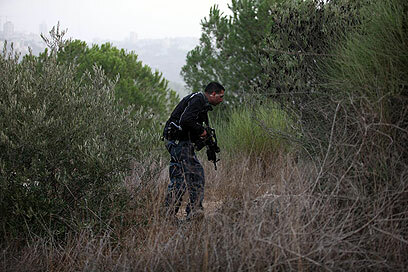 Large police forces from the Jerusalem District scoured the area as well in coordination with the IDF. 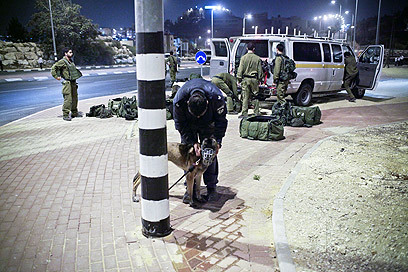 The forces arrived at Kfar Iksa, which is located west of Jerusalem, and searched the homes in the village, where the suspect is believed to be hiding. A joint army and police operations center was set up on the outskirts of the village to coordinate the manhunt. Defense establishment officials estimate that the terrorist exploited the fact that the separation fence, which divides Israeli and Palestinian territories, does not extend to Kfar Iksa, which is located less than half a kilometer from Ramot. The attacker could have slipped in and out of the neighborhood unimpeded. Earlier, forensic experts scoured the crime scene for evidence. Dozens of curious onlookers gathered at the site. "We are currently conducting an investigation and checking all possible leads," Police Commander Haim Blumenfeld said. "We have evidence from the scene, and at the moment the primary lead focuses on a nationalistic motive." Magen David Adom emergency services said that the teen was stabbed twice, in the abdomen and in the back. He was rushed to Hadassah Ein Kerem Hospital in Jerusalem in serious condition. The patient underwent a surgery and hospital officials said later that his condition had improved. His state was defined as moderate, and he appears to be out of immediate danger. Waiting outside the operating room, the Ne'emad's father told Ynet that he was informed of the attack by his younger son. "It is a great scare, and we are trying to deal with it," he said. "We are mostly busy with praying for him right now." "We won't stop living here, it could have happened anywhere and no one is immune," the victim's mother said. "I never thought that it's dangerous to let my kid go out on the street." According to an initial inquiry, the police and MDA received a call about a stabbing victim around 4 pm. Eyewitnesses told Ynet that the attacker came up to Ne'emad, who was walking down a street with his friend, and stabbed him without any provocation. A local doctor who rushed to aid the victim said that "the attacker began to chase a 12-year-old girl, but fortunately he failed to catch her." When onlookers began to gather on the scene, the perpetrator escaped. The second teen's mother said that Ne'emad attempted to fight the attacker after being stabbed for the first time. The attacker tried to chase her son as well, but the latter managed to evade him. The attacker then returned and tried to stab Ne'emad again. Security forces and medical teams were dispatched to the scene immediately, where they discovered the youth, bleeding from multiple stab wounds. Eliezer Asulin, the first MDA paramedic on the scene, told Ynet: "We arrived at the site and found a young man lying on the floor and suffering from stab wounds in his abdomen and back. "He lost a considerable amount of blood and his condition began deteriorating as we were treating him. We evacuated him as soon as possible." A local resident said that many Palestinians from Beit Iksa frequent the Ramot neighborhood. He added that while the area hasn't seen hostile incidents lately, the Palestinians "often taunt us and the young women who pass by." 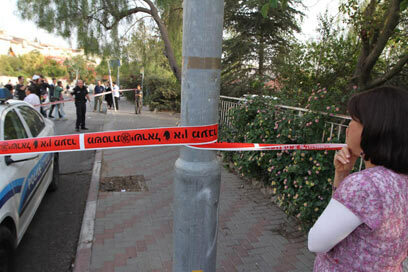 See all talkbacks "Stabbing attack in Jerusalem; youth hurt"